Welcome back to the Coffee Cafe! I hope you all had a great week. If you're new to the cafe, let me take a moment to explain what it's all about. This is a weekly post in which I share things that have caught my attention around the blogosphere, interwebz, Pinterest, etc. The format is always the same: 4 recipes, 3 crafts, 2 parenting articles and 1 quote or pretty picture to wrap it all up. Sound good? Great! Let's get started. 1. Creamy Spinach Tomato Tortellini. This recipe has been on my "recipes to try" Pinterest board for a while now. I'm not sure why I've not made it yet; but I intend to rectify that this week! This dish looks so creamy and yummy, not to mention easy, which is always a plus. I might add some diced chicken for a little extra protein to the dish, as well. 2. Honey Garlic Crunch Chicken. Also on the menu this week will be these chicken tenders. I can practically "see" the crunchiness in this photo. They just look SO GOOD!! The thing I like most about this recipe is that the chicken isn't cut up into "bite size" pieces. Sometimes the little pieces can be hard, and very messy, to deal with when using flour and egg. I sure hope mine turn out as pretty as this picture! 3. Rolo Chocolate Chip Cookie Cups. Yes, yes...you read that correctly. A chocolatey, caramel filled ooey gooey little Rolo candy inside a little chocolate chip cookie baked in a little muffin cup! At this point, it's ok to squeal just a little bit! I did when I saw these. Seriously, beyond excited to try these! 4. Mini Muffin Pancake Bites: Also making an appearance in the mini muffin tin are these adorable little Mini Muffin Pancake Bites! I thought these were both genius and adorable! I mean, can you even stand the cuteness of these?! They also look relatively easy to make. Perfect for a lazy Saturday morning breakfast. When I make them, I may try to freeze a few of them just to see if that works, for future reference. If it does, then they would be a great and easy busy week day morning breakfast as well! 2. Spray painting the bottom of pinecones, and then flipping them over so that the look like pretty flowers? Oh my word, what a clever idea from Vanessa over at "A Fanciful Twist" You go girl! Rock that creativity!! 3. 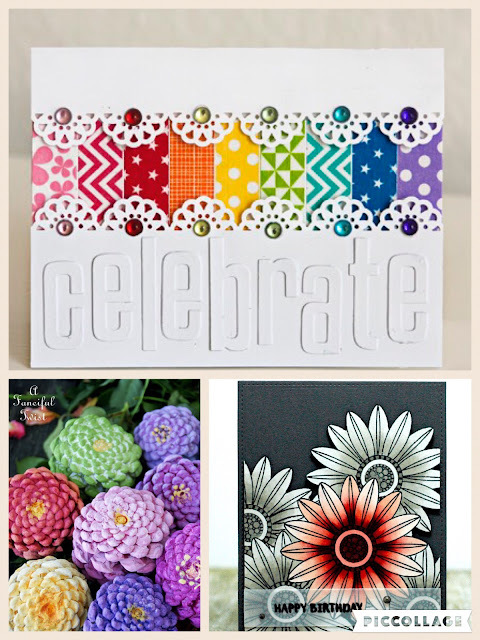 This gorgeous stunning floral card made by Coralynn takes my breath away every time I look at it; and believe me....I've looked at it a LOT! I can't take my eyes off it. It's just beautiful! The whole thing just catches my eye in a different way every time I see it. 1. This list of Mother daughter dates over at Sugar, Spice and Glitter is such a great list of ideas. I love how it is split into different budget categories as well. I think the relationship between mothers and daughters is just so important. The greatest influence on a girl's life is her mother, I believe. I have always try to ensure that my daughter and I have a loving and strong relationship. Oh, it's not always pretty, that's for sure! But it's steady, it's solid, it's there front and center in both our lives. She's almost 16 years old and I think the reason we have a good relationship now is because we did spend time together doing fun things when she was smaller and continued as she grew and her interests few and changed as well. Go read the list and be inspired! 2. I can also totally relate to this article from Chelsea over at Everyday Light: "She is Not Me" I love my daughter beyond anything I ever imagined and she is the spitting image of me. Seriously, people who have met me and then meet her totally separately know instantly that she's my daughter! However, she is definitely her own person! I love how in this article she talks about all the ways she knows her daughter may not be like her. That she may never want to be a photographer or like blue grass music or watch musicals. I know my daughter may never enjoy crafting, reading or red wine. She may never develop a taste for Jazz music or Indie music; and that is totally ok, because as Chelsea says, "She is not me, she is part of me....the best parts of me"
Finally, we'll wrap it all up this week with this quote. Have a great Sunday; and I'll see you again next week!